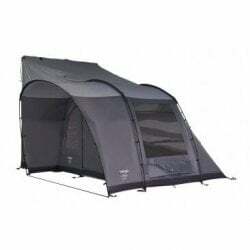 The Vango Galli AirAway Awning is ideal for anyone who wants a larger and more usable space on their outdoor holiday. The inflatable AirBeam technology means you can pitch this awning in a matter of minutes so you’ve got more time to enjoy your holiday. The pre-angled beams mean there’s ample height throughout, and the option to add up to two inner tents means there’s great potential to create extra sleeping space. Sentinel Pro 420 Fabric – Superior strength and long-lasting durability, combined with PU technical coatings make Sentinel Pro exceptional in terms of waterproofness. The Galli II has been updated for 2018 with new skylight windows, allowing stargazing at night and a bright living area during the day. The New AirZone system enhances the circulation of air reducing the chances of condensation. There is the option to add one or two inner bedrooms to offer sleeping space at the rear.